Alright, bear with me as we untangle the knot of Fabio Lione's new band Eternal Idol. A few years back the current Angra and Rhapsody Of Fire vocalist did a spot with fellow Italians and power metal band Hollow Haze. That band goes through lead vocalists like a guitarist goes through picks during a concert. Lione exited the band after Countdown To Revenge. In the meantime, he did new albums for both Angra and Rhapsody Of Fire. Also, in the inbetween time, Hollow Haze used five, count them, five vocalists on 2015's Memories of an Ancient Time. After the album release they settled upon (the smokin' hot by the way) Giorgia Colleluori as their lead vocalist in August 2015. Meanwhile, Mr Lione thought, "I'm not busy. Why not form a third band." He scratches his head. "Who should I get for my band." He snaps his fingers, and says, "I know. Let's grab some folks from Hollow Haze. They won't mind, even though I bailed on them. Besides, who wouldn't want to work for me. I'm Fabio!" Enter ex-Hollow Haze guitar whiz Nick Savio, current drummer Camillo Colleluori and his daughter Ms Colleluori on lead vocals. The odd man out in the Hollow Haze connection is Andrea Buratto from Hell In The Club and Secret Sphere on bass. Now that's much preface (and many words) to get to speaking about Eternal Idol's debut long player, The Unrevealed Secret. But those revelations only allow us to reveal what we already probably suspect of Eternal Idol's sound. Yup. You guessed it. The musical apple doesn't fall far from the proverbial tree of genre. This is melodic and symphonic power metal with two lead vocalists, one male, one female. That, in itself, isn't uncommon or novel. Think of all the bands that have a operatic female lead and some jackass doing dirty vocals. The thing is that Ms Colleluori isn't necessarily of the operatic variety. No, she's more the straight metal singer, like Fabio Lione. In fact, they are nearly a perfect match to compliment each other. And that makes this the strength of Lione's new venture. Otherwise, the music here is very generic, and I say that in the very best sense, especially if you like Rhapsody Of Fire. While not quite as bombastic and breathtaking as that band's cinematic metal, Eternal Idol nails melodic symphonic power metal with ease, grace, and power for an exceptional and enjoyable listening experience. It's got everything you want and expect from this classic genre: a broad and expansive canvas of orchestration, powerful, clean, and soaring melodic vocals, glittering keyboards, generous and harmonious riffs, and an abundance of killer lead guitar solos. 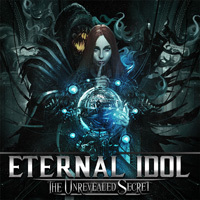 In other words, suffice to say if you like the genre, like Rhapsody Of Fire or Hollow Haze, you will dig both Eternal Idol and their new album, The Unrevealed Secret. Easily recommended. Suffice to say if you like the genre, like Rhapsody Of Fire or Hollow Haze, you will dig both Eternal Idol and their new album, The Unrevealed Secret. Easily recommended.